Schneider Electric's Square D electrical panels hold circuit breakers for power distribution. Only Square D style circuit breakers fit in a Square D style panel box. Square D circuit breakers and panels use a square with a capitol D inside as an identification marker. Three wires enter a residential Square D service panel from the electric meter; two 120-volt hot wires and a neutral. These wires connect to bus bars. A forth bus bar connects to a wire that grounds the panel's case to earth. A bonding band ties the ground and neutral bus bars together. Turn off the power to the panel before working on it. 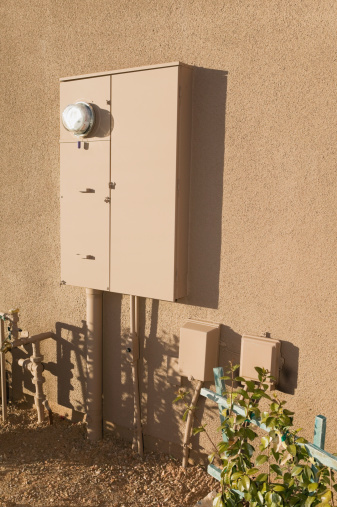 Switch the electricity to the Square D panel off at the "Main" panel, located outside next to the electric meter. Most switches use a circuit breaker style switch with a "Main" label. Examine the wires entering the Square D panel's housing. The electric supply wires, the hot wires, usually have black or red insulation, and the neutral wire sometimes uses white insulation. If the neutral wire uses any color insulation but white, then the hot wires must have colored tape labels--often red tape--wrapped around them for identification. The ground wire sometimes uses a green-colored covering.Other times it does not use any covering. Peel the last 3/4 inch of the insulation from the wires entering the Square D panel from the main switch. 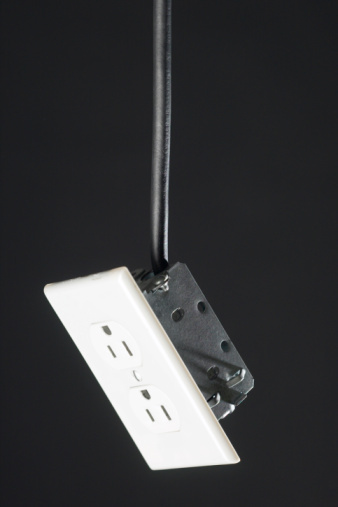 Use a utility knife to score the insulation around the wire 3/4 inch from its end. Slice the insulation from the scored line to the end of the wire. Grab the insulation and pull it off. The wires feeding electricity to the Square D panel uses braided wire strands. Wire strippers will not work on this type of wire. Loosen the Square D panel's bus bar lugs with the correct-size Allen wrench. The lugs hold the wires to the top of the bus bars. Apply a thin coat of anti-oxidizing paste to the stripped ends of the wires feeding the panel if the wires use aluminum wire strands. Often the wires feeding panels use aluminum as the conductor. Push a hot wire into the far right bus bar lug and tighten the lug with the Allen wrench. Push the second hot wire into the far left bus bar lug and tighten the lug with the Allen wrench. The lugs on these two bus bars are larger than the neutral and ground lugs. Push the neutral wire into the Square D panel's neutral bus bar, the bus bar with the medium-size lug. Tighten the lug with the Allen wrench. Push the ground wire into the Square D panel's ground bus bar, the bus bar with the smallest lug. Tighten the lug with the Allen wrench. The ground bus bar has green terminal lugs screwed into the bus bar. What Is a Square of Shingles?